Typical coating temperatures are about 800°F for all of our PVD coatings. 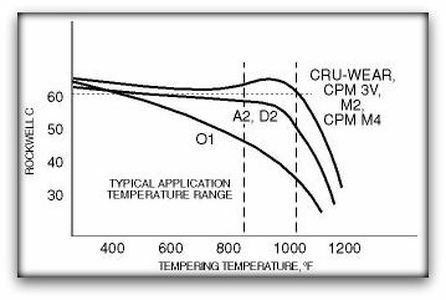 Coating temperature may have an effect on the hardness of your parts and could cause parts to shrink or grow. To minimize the effect our coating temperature might have on your parts, we suggest tempering them at 900 – 950°F before sending them out for coating. Many of our customers specify a hardness on their prints, resulting in the heat treater tempering at the lowest temperature possible to achieve the specified hardness. This results in many common tool steels being tempered at 450°F, or below. When we coat those parts at 800°F, there is a higher probability of part distortion than if the part were tempered at 900°F. 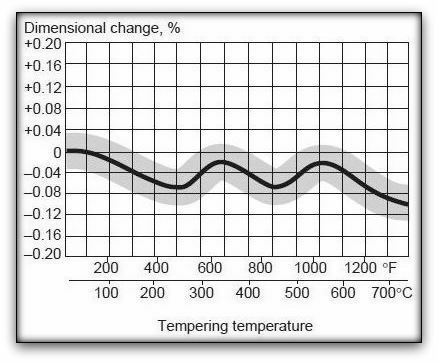 The top picture to the right shows size change as a function of temperature, while the bottom picture shows hardness as a function of temperature. From the bottom picture, it is apparent that many tool steels can be tempered at 900°F, or above, and still yield a hardness above 55 Rc. It is also apparent why we do not recommend using O-1 if you are going to coat it later. PVD Hard Coatings to Improve Your Bottom Line!